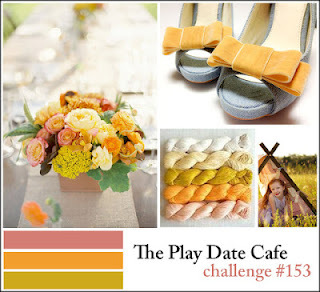 Welcome to The Play Date Cafe Challenge #153. The colors this week are stunning! And we have an excellent prize for the "Cup Of The Week" , a shopping spree with Simon Says Stamp! Here is what I created using this weeks color story! 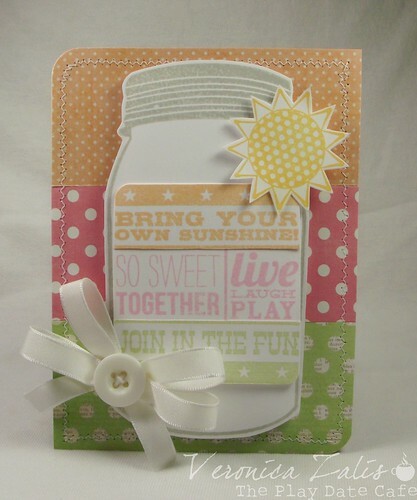 I used one of my favorite stamp sets from Unity Stamp Company "Jar Of Sunshine". I recently had a card published using Unity Stamps, and received this set for FREE and a $25 Pay Pal payment. Sweet! I can't wait to see what you create using this weeks PDCC color story! Gorgeous card Veronica! I love those stamps! Unity is an awesome company that gives great pub incentives! Once I had 3 cards published on one page for a one stamp used three ways challenge and I used a Unity stamp amd got that incentive 3 times! This is so super cute! Such a fun card! Love that cute jar!! This is adorable! I love your jar of fun phrases! The Play Date Cafe - One More Try! Your Next Stamp Fun Friday - Thanks A Latte! Happy World Card Making Day - I Believe In You! The Play Date Cafe # 152 - Color Splash!